Summary of the project: I spent the best month of my life creating a comms campaign to encourage businesses in Recife to recycle with Edifício Ecológico. To quote Ewa, 'I spent the best month of my life creating a comms campaign to encourage businesses in Recife to recycle with Edifício Ecológico'. 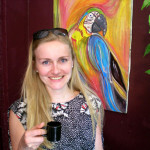 October 2011 marked the beginning of what Ewa describes as 'my biggest life adventure'. She was chosen as a representative of her agency - Proximity London – to work with Edifício Ecológico (EE) to help get medium-sized business to sign up to the EE scheme. A tough brief, but Ewa was clearly up for the challenge. Fast forward 5 months later and Ewa had arrived in Brazil and dived right in. It was a very busy month, but Ewa embraced the challenge with determination, passion, and a huge smile on her face. Click on the case study link to find out just how she prepared for the journey, what adventures she embraced and what she and her team came up with at the end of a very busy 30 days. To learn more about Ewa before she embarked on TIE, click here. And to see a more day-to-day account of her time in Brazil, definitely click on her blog link above.